but he longed to chase something with a tail. so one day, he sneaked out of the fence and found his kindred spirit. he never felt completely safe with his new playmate. "the Lord is good to all; He has compassion on all He has made." Your pictures... I will never ever be able to take these over here in the Netherlands. 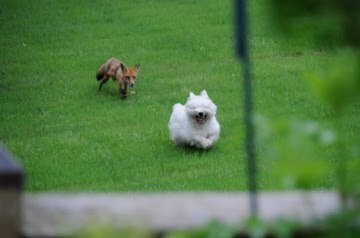 We do have these cute white lovelies but the fox, no foxes. Lovely post, Lea. I can't believe you were able to capture these photos! how adorable!!! stay safe jackson!!! I loved reading this, so nice to pop over on such a hectic day and see these images. I simply adore the film, my fav childhood film, and seeing it is real life was heart warming. Do hope you are well, the movers are here today and all systems are running at full steam. Those are really nice pictures. I love Westies. Wow, I can't believe you got pictures of that. Just amazing. Lea I thought I would answer you here about soap, it makes about 30 bars of soap and yes, you can add oatmeal, or poppy seeds, (which makes lovely soap,) you can add stone ground cornmeal. It makes lovely bars too. It is fun to make. Country Living has a book called Handmade Soap it has great recipes. That is so cute! 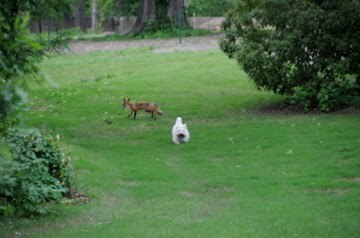 We've not seen a fox in our yard, but my dog chases many rabbits, armadillos and other such animals!! These photos are priceless! Hans did well with these!! I always wonder how Nat.Geographic and the others can get those amazing shots! What a wonderful moment you've captured. And thank you so much for stopping by my site. I'm glad you did. I want to come and browse when I have more time..... you have a lovely place! Here's wishing you unexpected glimpses of heaven on earth today! So I'm leaving this weird comment all over Pretty Blog Land. This is cute! Thank you for commenting on my guest post at The Shiny Pebble. Looking foward to sifting through your blog. Happy Wednesday. We saw a red fox in our yard for the first time last winter. I was intrigued yet a little scared at the site. 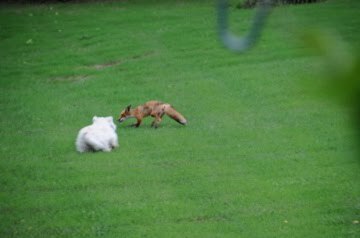 While on vacation last summer, we had two or three gray foxes that would show up in the back yard each evening. Again, very interesting to watch, but can't fight the urge to quickly pull the kids inside! Looks like Jackson can "dish" it out but can't take it. Run for your life buddy! What a lovely blog you have here. Your little Jacksonis adorable. I can't believe he actually plays with a fox. I found out about your blog site from Brenda Leyland. 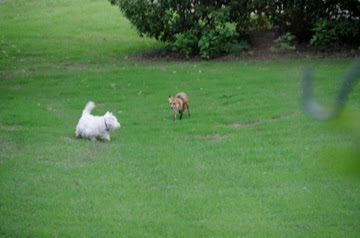 I enjoyed your story and pictures of the fox and the hound. I look forward to future visits to your site. I hope you will also visit mine. taking a nap" Love it and giggling. I usually feel that way. And the fox reminds me so much of he fox in the book "The Little Prince." I love those pictures. We have a fox den in our yard and I keep hoping to get glimpses of the foxes. The first time one of the babies ran by my bedroom window crying I almost ran outside trying to help whatever was in trouble. My husband just laughed at me and told me what it was. Enjoy your little fox! How cute is that...love these photos. I am really enjoying your blog, but I got such a kick out of this and the the playful pups worry about if his new friend might decide to "eat" him.